The New York Times writes ‘Lisa Moore, an Australian pianist long based in and around New York, has always been a natural, compelling storyteller’. TimeOut New York describes her as ‘the wonderfully lyrical pianist’ whereas The New Yorker refers to her as ‘New York’s queen of avant-garde piano’. Lisa Moore’s performances combine music and theatre with expressive and emotional power – whether in the delivery of the simplest song, a solo recital, or a fiendish chamber score. Pitchfork writes “She’s the best kind of contemporary classical musician, one so fearsomely game that she inspires composers to offer her their most wildly unplayable ideas”. Lisa Moore has released ten solo discs (Cantaloupe, Orange Mountain Music, Irreverence Group Music, Bandcamp, Tall Poppies) ranging from Leoš Janáçek to Philip Glass. Her 2016 disc The Stone People (Cantaloupe) – featuring the music of John Luther Adams, Martin Bresnick, Missy Mazzoli, Kate Moore, Frederic Rzewski, and Julia Wolfe – made The New York Times Top Classical Albums 2016 list and the 2017 Naxos Critics’ Choice. Lisa Moore has recorded over thirty collaborative ensemble discs (Sony, Nonesuch, DG, BMG, New World, ABC Classics, Albany, New Albion, Starkland, Harmonia Mundi). Her Steve Reich Music for Eighteen Musicians (Harmonia Mundi) with Ensemble Signal made The New York Times Top Classical Albums 2015 list. This Australian virtuoso has performed with a large and diverse range of musicians and artists throughout the globe – the London Sinfonietta, New York City Ballet, Chamber Music Society of Lincoln Center, Bang on a Can All-Stars, Sydney Symphony Orchestra, Steve Reich Ensemble, Paul Dresher Double Duo, Grand Band,Dean-Moore-Dean Trio, TwoSense, So Percussion, Don Byron Adventurers Orchestra, Ensemble Signal, Le Train Bleu, Third Coast Percussion, Da Capo Chamber Players, Eighth Blackbird, American Composers Orchestra, Mabou Mines Theater, ExhAust, Howl, Eliot Feld Dance, Susan Marshall Dance, Sequitur, Music at the Anthology, St. Lukes Orchestra, Australia Ensemble, Westchester Philharmonic, New York League of Composers ISCM, Alpha Centauri Ensemble, Terra Australis, and John Jasperse Dance Company. Lisa Moore has performed in the world’s greatest concert halls – La Scala, Musikverein, Sydney Opera House, Carnegie Hall, and the Royal Albert Hall. Her guest appearances in festivals include Holland, Lincoln Center, Big Ears, Irving S. Gilmore, Chautauqua, Schleswig-Holstein, BBC Proms, Israel, Warsaw, Uzbekistan, Musica Ficta Lithuania, Prague Spring, Istanbul, Athens, Brussels, Nantes, Rome, Taormina, Barbican, Southbank’s Meltdown, Dublin’s Crash, Graz, Vienna, Huddersfield, Scotia, Paris d’Automne, Shanghai, Beijing, Hong Kong, Turin, Palermo, Barcelona, Heidelberg, Berlin, Perugia, Tanglewood, Mendocino, FENAM Sacramento, Arts and Ideas New Haven, Sundance Institute, Houston Da Camera, Jacob’s Pillow, Aspen, Norfolk, Sandpoint, Saratoga, Victoriaville, Ojai, Other Minds, Sonic Boom, BAM Next Wave, Ecstatic Music, Bang on a Can Marathons, Bargemusic, Keys to the Future, Kettlecorn New Music, MassMoca, Healing The Divide – CSUFullerton, Mizzou, Music 10 Blonay, Adelaide, Perth, Queensland, Canberra International Music, Sydney, Sydney Olympic Arts, Sydney Spring, Sydney Mostly Mozart, Sydney Big Ideas, Sydney Extended Play, Tyalgum Music, Brisbane Biennale, Melbourne Metropolis, and the Darwin International Festival. Lisa Moore won the silver medal in the 1981 Rockefeller-Carnegie Hall International American Music Competition. She moved to New York City in 1985. In 1992 she won the Australian Music Center Sounds Australian award ‘best performance of an Australian work” for Stroke by Michael Smetanin. From 1992-2008 she was the founding pianist for the Bang On A Can All-Stars – New York’s electro-acoustic sextet and winner of the Musical America 2005 Ensemble of the Year Award. Passionately dedicated to the music of our time, as well as the great musical canon, Lisa Moore has premiered hundreds of new works, collaborating with over 200 composers – including John Adams, Martin Bresnick, Gerard Brophy, Elliott Carter, Ornette Coleman, Mario Davidovsky, Brett Dean, Phillip Glass, Michael Gordon, Jonny Greenwood, Elena Kats-Chernin, Hannah Lash, David Lang, Missy Mazzoli, Kate Moore, Thurston Moore, Meredith Monk, George Perle, Shulamit Ran, Steve Reich, Frederic Rzewski, Peter Sculthorpe, Michael Smetanin, Joan Tower, Julia Wolfe, Iannis Xenakis, Du Yun, and Evan Ziporyn. 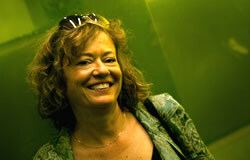 As a concerto soloist Lisa Moore has performed with the London Sinfonietta, Australian Chamber Orchestra, Wesleyan University Orchestra with Sumarsam Gamelan, Albany, La Jolla, Sydney, Tasmania, Thai and Canberra Symphony Orchestras, Monash Academy Orchestra, Philharmonia Virtuosi and the Queensland Philharmonic. She has performed under the batons of Leonard Bernstein, Pierre Boulez, Reinbert de Leeuw, Bradley Lubman, Jorge Mester, Richard Mills, Benjamin Northey, Angel Gil-Ordonez, David Robertson, Steven Schick, and Edo de Waart. As an artistic curator Lisa Moore produced Australia’s Canberra International Music Festival 2008 Sounds Alive ‘08 series, ‘importing’ artists from around the world for 10 days of concerts at the Street Theatre in Canberra. New projects inspire the enquiring nature of Lisa Moore’s imaginative creativity. They include Tempus Duo with cellist Trish O’Brien, Handwork: Goldberg Variations – a piano duo with Sonya Lifschitz; Dean-Moore-Dean Trio concerts with Brett Dean (viola) and Paul Dean (clarinet); Grand Band – a piano sextet featuring six New York pianists, and TwoSense – a commissioning cello and piano duo (with Ashley Bathgate) dedicated to expanding the chamber music repertoire. Lisa Moore makes regular guest teaching appearances at conservatories around the world. Past residencies include the Banff Centre (Canada), Royal Academy of Music (London), Eastman School of Music, the Sydney and Queensland Conservatoriums, Australian Youth Orchestra National Music Camp, and the Australian National Academy of Music in Melbourne. Lisa coaches (and occasionally conducts) at the Yale-Norfolk Festival New Music Workshop. From 2007-2016 she taught piano at Wesleyan University (CT).